What can improve your mood, boost your ability to fend off infection, and lower your risk for heart disease, diabetes, high blood pressure, and colon cancer? The answer is regular exercise. It may seem too good to be true, but it's not. Hundreds of studies demonstrate that exercise helps you feel better and live longer. Starting to Exercise answers many important questions about physical activity. It will also help guide you through starting and maintaining an exercise program that suits your abilities and lifestyle. What can improve your mood, boost your ability to fend off infection, and lower your risk for heart disease, diabetes, high blood pressure, and colon cancer? The answer is regular exercise. It may seem too good to be true, but it's not. 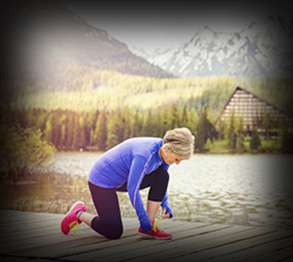 Hundreds of studies conducted over the past 50 years demonstrate that exercise helps you feel better and live longer. This report answers many important questions about physical activity, from how your body changes through exercise to what diseases it helps prevent. It will also help guide you through starting and maintaining an exercise program that suits your abilities and lifestyle. Throughout, you'll find advice on staying motivated, measuring your progress, and being a savvy consumer of fitness equipment, as well as tools and tips designed to help make exercise work for you. What can exercise do for you? Should you talk to a doctor first? Getting started: What type of exercise should you do? Want to change the way you experience exercise? These tips can make workouts more enjoyable. 1. Mix it up. Bored by the same old, same-old schedule of exercise? Change the activities you’re doing and the amount of time spent on each. Sign up for a Pilates class or try qigong. Even a change of scenery can keep you motivated. For example, try a long weekend hike in the woods instead of some shorter neighborhood walks during the week. Choose combinations and activities that appeal to you. Whatever you choose, it’s best to be active at least three days a week. 2. Keep moving. Look for ways to add bits of activity and recreational exercise to scheduled activity time—an extra lap around the mall when you’re shopping, some stair climbing, or a Saturday morning bike ride. 3. Wear a pedometer, FitBit, or other activity monitor. Even the simplest step-counter can up the ante on exercise, according to a 2018 review of six studies. Over all, those who clipped on a pedometer raised their physical activity by up to 3,000 steps a day compared with those not using a pedometer. In a classic review of 26 studies, published in The Journal of the American Medical Association, in addition to taking more steps a day, pedometer wearers lowered their systolic blood pressure by 3.8 points and lost weight compared with nonwearers. Setting a step goal counted for a lot. Those who did so significantly increased activity; those who didn’t generally remained at baseline. Try investing in a pedometer or some other type of activity monitor, and set a step goal for yourself, such as 10,000 steps a day. To translate aerobic exercise guidelines from the page to the pavement, aim for 3,000 steps in 30 minutes— that’s 100 steps a minute. Five days of this (or three days of 5,000 steps in 50 minutes) enables you to meet your weekly goal of 150 minutes of moderate aerobic activity. Can’t find a chunk of free time that long in your schedule? Try 10-minute chunks—that is, 1,000 steps in 10 minutes—throughout the week. For a more high-tech option, you might want to consider an activity monitor like FitBit or Garmin. In addition to step counts, many of these devices also track calorie burn, intensity of activity, heart rate, and even your sleep patterns. 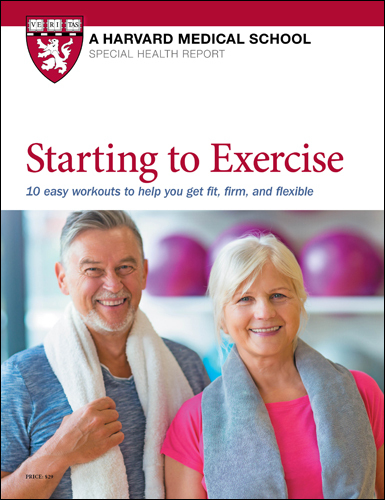 • The American Council on Exercise offers an extensive library of exercises sorted by ability level, muscles targeted, or equipment needed, at www.acefitness. org/exerciselibrary. You can also view selected exercises in motion. • The Centers for Disease Control and Prevention posts video clips describing intensity levels as well as aerobic and strength exercises for home and gym. Easier variations on strength exercises are included. Go to www.cdc.gov/physicalactivity/ everyone/videos. • Collage Video sells a wide range of exercise videos. Find them at www.collagevideo.com. 5. Rise to the challenge. If your workouts aren’t challenging or interesting enough, expand your horizons by focusing on both exercise and healthy eating. The Presidential Active Lifestyle Award, at www.health.harvard.edu/PALA, encourages you to meet minimum activity requirements and also set healthy eating goals over the course of eight weeks.